Aidan and Denali were born on April 27, 2008 and joined the Exhibit Pack on August 4th, 2008. The 2008 pup introduction was very unique for the Center as it was the first time that our Exhibit pack contained three subspecies of the gray wolf and three age groups-the arctic wolves (Canis lupus arctos) born in 2000, Great Plains wolves (Canis lupus nubilus) born in 2004 and Rocky Mountain wolves (Canis lupus occidentalis) born in 2008. Denali was fairly immune to dominance rank order. He was more prone to social engagement and avoided interactions that related to dominance. He was encouraged to be more dominant by the 2nd ranking male, Grizzer, who allowed Denali to readily take food or possessions without any sign of threat display. By the time Denali turned two years of age, he was always very social, but also very testing. Grizzer attempted to assert some rank over Denali, but starting at 2 years of age wasn’t very effective. In July 2010, the pack leader, Shadow an arctic wolf born in 2000, was retired which essentially left no leadership in the pack. In 2011, we had a tragic injury to Maya, the dominant female and littermate to Grizzer that resulted in her euthanasia and prompted the decision to retire Grizzer. Without Grizzer’s limits, Denali was looking for an opportunity to assert his rank and did so to both the 2012 and 2016 pup litters. He was especially focused on Grayson, an arctic pup introduced to the Exhibit in August 2016. Visitors to the Center or to the webcam can witness Denali’s tendency to gain full possession of the weekly deer carcass, making Grayson and often Boltz wait their turn. Dynamics are always changing in a wolf pack and we know that Denali will always look for opportunities to possess his food and test his limits. Each wolf in the Exhibit and Retired Pack will have regular updates posted to reveal their individual personalities and the dynamics of their respective packs, please check the individual logs for details. If you are interested in sponsoring Denali, please click here. Denali has no problem making tracks in the deep snow, but his larger body size means he does sink a bit more. As we continue to accumulate snow, we also see the snow change texture, making it a bit of a struggle for wolves to travel. When temperatures warm, we see a circumstance where even the wolves over-sized paws don’t keep them from sinking. We call it “postholing”, when a foot goes in and it sinks. But, the warmer days don’t necessarily mean warmer nights. As the melt in Northern Minnesota continues, we still have some cooler nights, making for a hard pack snow especially in the early morning hours. 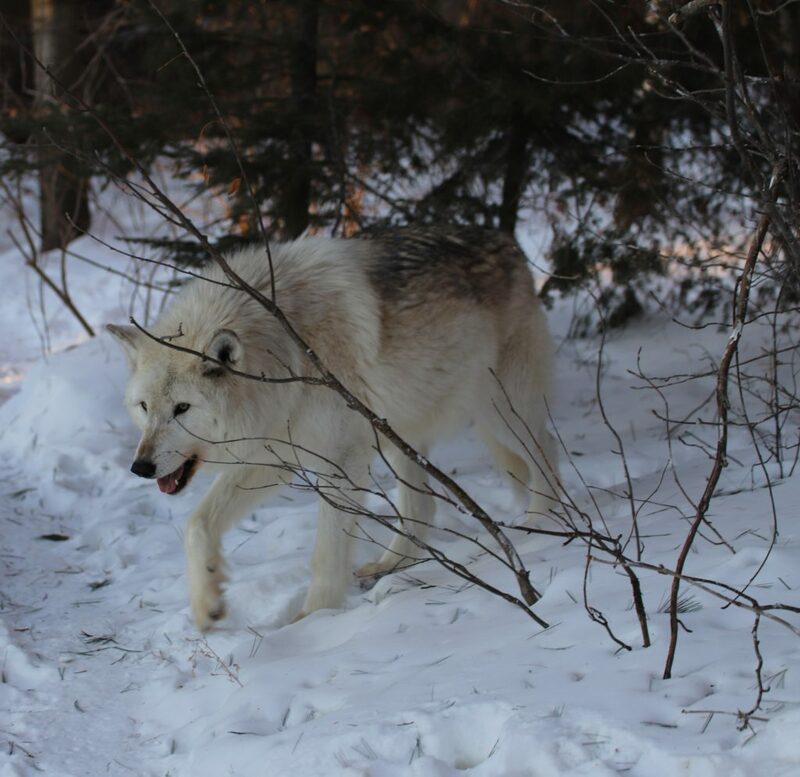 It’s the hard pack snow that give the advantage to the lighter wolves, like Axel and Grayson and chases throughout the upper enclosure are restricted to the wolves under the age of 8. Despite his advancing age, Denali continues to be an active member of the Exhibit Pack and while he may not always show tendencies to be the leader of this social group, the younger wolves seem to congregate towards him when there’s some uncertainty. Earlier this winter, we had some concerns that Denali maybe showing some signs of aging with weakness in his hips. Staff began to focus on doing some daily massage work and try diligently to make sure he gets his morning nutritional supplements. At the Center, all wolves over the age of six years receive some joint supplements to aid with aging conditions. Denali also has a small lump on his foreleg similar to Aidan’s growth, so we are actively treating Denali with antihistamines to keep this mass cell growth in check. Despite Denali’s size and ability to possess just about any food that is in the enclosure, he is crafty when it comes to delivery of medication and doesn’t care to possess a meatball that smells like a pill. He will drop, shake, nibble or lick around the pill, often consuming everything but the pill. Staff have ingenious methods of delivery that involve chicken skins, butter, bonedust, dried venison cakes and even cream cheese to make sure he gets the resources we think he needs (even though he clearly doesn’t agree that he needs them). Even though it’s a challenge, staff keep trying. He does seem to be managing quite well and the frequent chases around the enclosure tell us that he is not ready for retirement just yet. Even on our record cold of -79 below windchill in January, Denali and the Exhibit Pack showed no sign of slowing down. We are over the winter hump and as days get longer, we will likely see dominance start to decrease. If Denali can stay strong into the spring, he is likely going to be an Exhibit Pack member throughout the summer, delaying retirement to next fall or beyond. Here is another example of our Ethogram code “EPTS” or Ears Pricked and Turned Sideways. This body posture is interpreted as one of piqued interest, but a bit intimidated. Of course, that is Axel with the T-1 tail posture over his back about to face-off with Denali. Neither of these two wolves seems confident enough to deal with direct confrontations, which can equate to lack of leadership abilities. 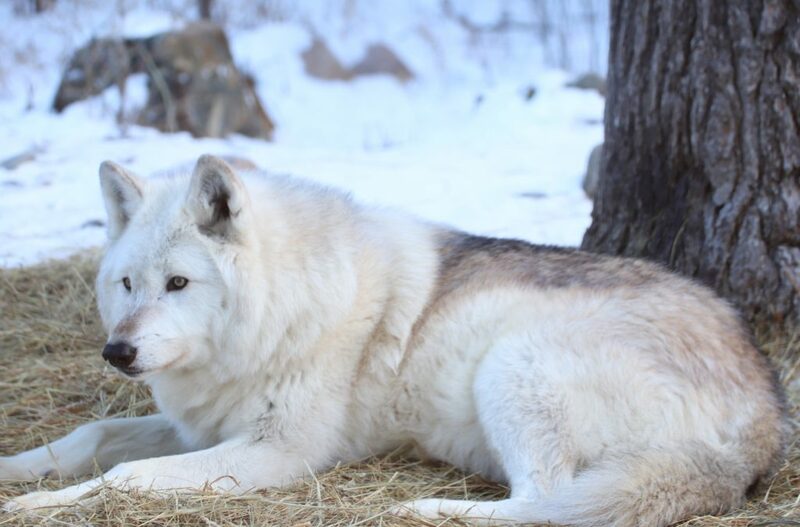 Denali has an excuse; At the age of 10 1/2, he is the oldest wolf we have managed in our Exhibit Pack. 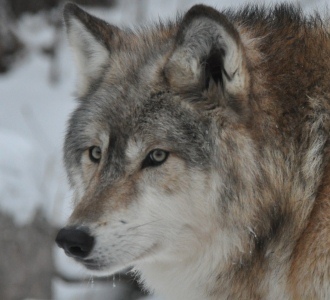 All other wolves in our 30 year history of captive wolf management have been retired by 10 years of age. Denali can be food possessive and determine who gets to share a carcass with him, but that doesn’t make him a leader. It only makes him a target at times, by the one wolf that sits, waits and watches for opportunities and that wolf is Grayson. Denali – The Mind Is Willing…but The Body? This log was written by Carolyn Owen and Karen Owen, participants of the Wolf Photography Weekend in early October. Denali was observed actively participating in several chases, mounting and jaw sparing behaviors. 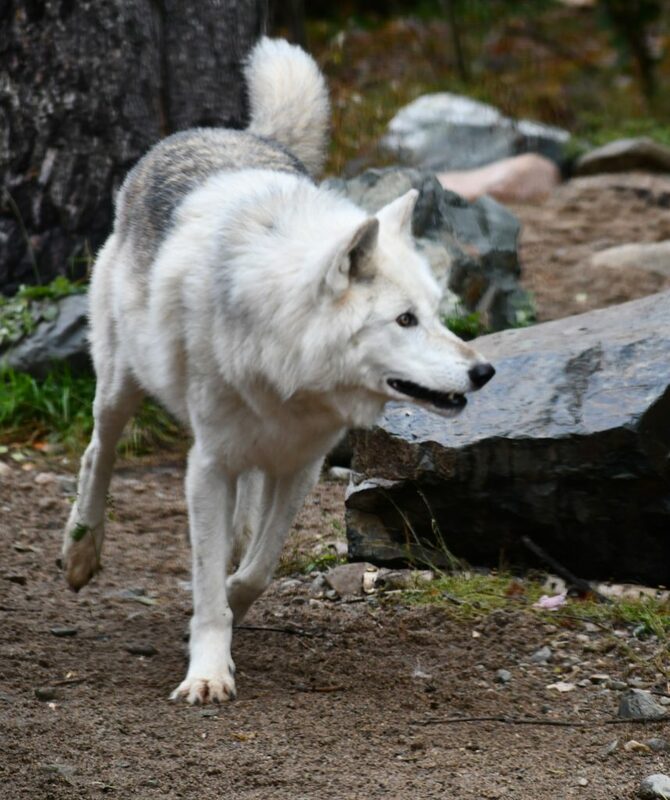 In this photo, Denali is observed rounding a corner to join the pack in a run around the enclosure. 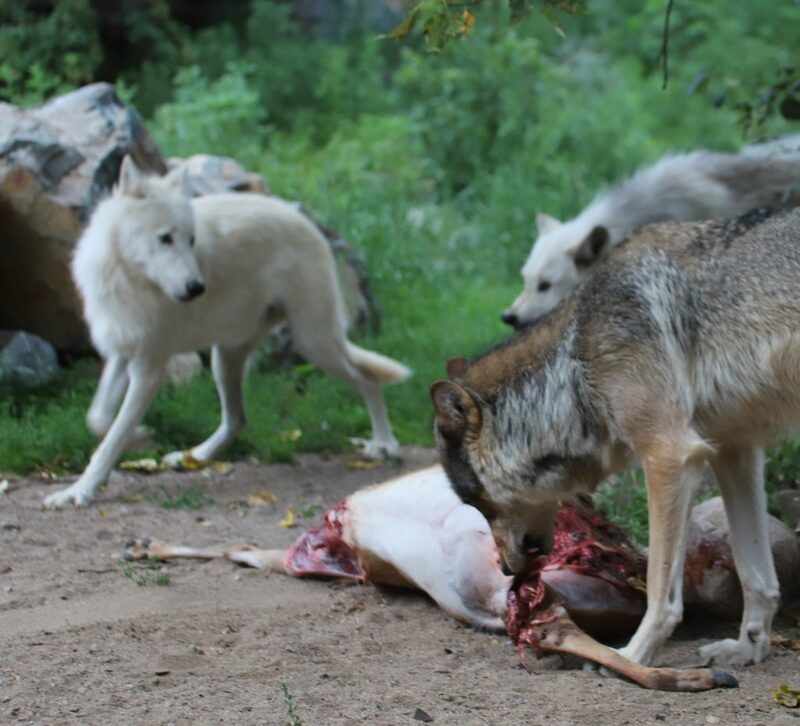 During the Saturday night feeding, Denali dominated the deer carcass allowing Boltz to feed for a limited time, keeping Axel and Grayson at a distance. After a period of time, however, Axel and Grayson were seen feeding. Denali has always been the wolf that controls the carcass, even though he wasn’t the wolf that controlled the pack. In the wild, higher ranking wolves may be the ones that eat first because they may be directly involved with making the kill, but in captivity, when the food is wheeled in a wheelbarrow, personality dictates who possesses food. One thing about Denali is that he has a lot of personality. 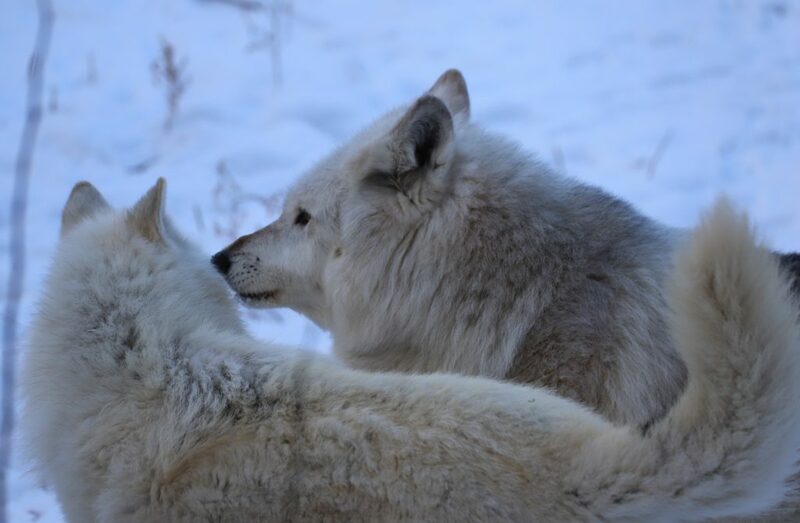 After Aidan was retired, Denali has not been showing much interest in Aidan, but he certainly has increased the amount of interaction with pack mates. He has become far more possessive of food and is the main influence on who gets to eat first. In the past, it was Axel, but as of July 28th, Boltz has come into favor. Other noticeable behaviors are the jaw sparring and rallying behaviors displayed during the cooler parts of the day. Denali also gets excited about any of the enclosure enrichment activities we provide. We know we have a successful idea when Denali does a full tail spin in a 360 degree circle and hops on over to the enrichment window. It’s nice to have feedback.